This lab was insightful into how electrical circuits work and the theme for my assignments is nature. 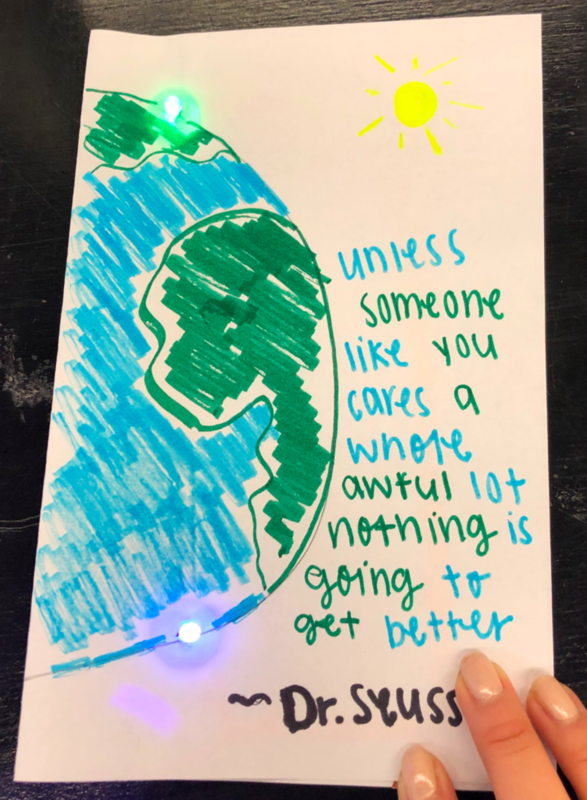 For the intro assignment I made a card with the Dr.Sesus quote: “Unless Someone Like You Cares A Whole Awful Lot Nothing Is Going To Get Better”. 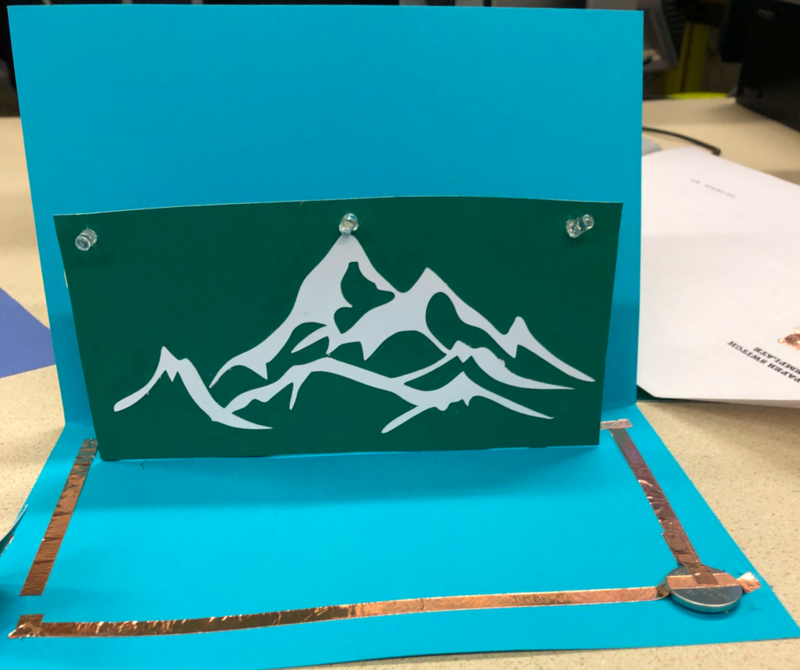 The circuit for this card required two batteries to light up the blue and green LEDs. At first the LEDs did were not lighting up and Duncan explained that the voltage drop of the colors I chose amounted to more than the 6 voltage the batteries powers. I learned the important elements of electric circuits such as the voltage drops, and how currents go travel through copper wire. 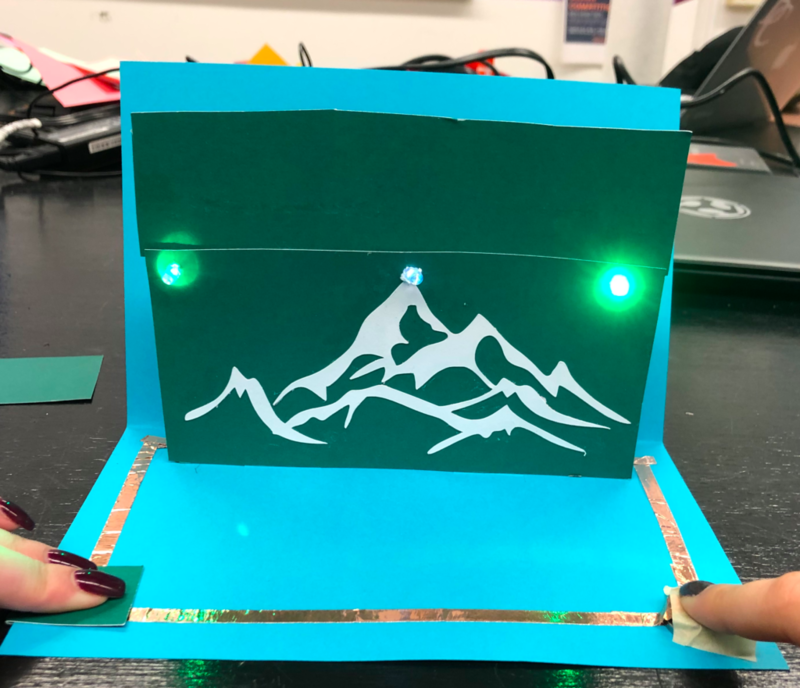 My pop up card has a mountain visual with LED lights that coordinate with the colors of the images. My first attempt actually did not light up and then I realized that I needed to create a parallel circuits since I have multiple LED lights. I used the resources provided to us on Moodle to research what a parallel circuit entails and made a sketch. 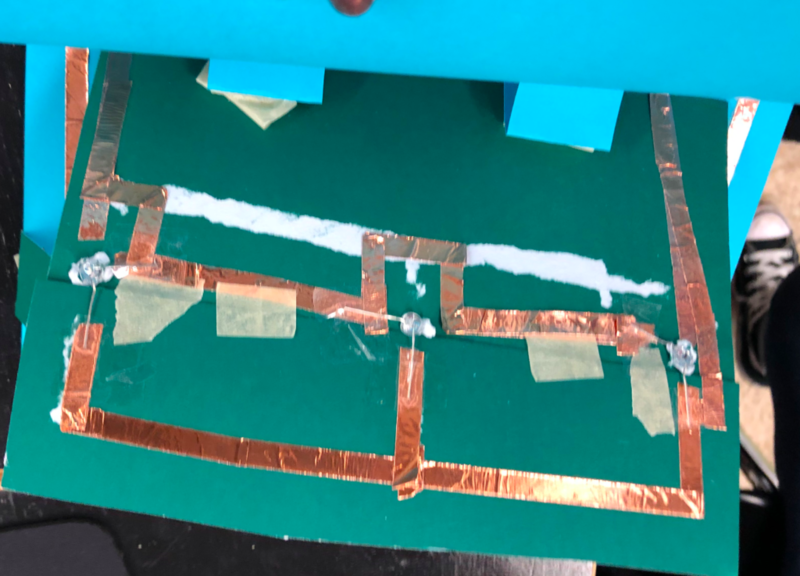 I made a sketch of the circuit and showed it to Duncan and he told me that the negative and positives lines could not touch. Hence that’s why it is called a parallel circuit! So I had to add an extra layer of card stock to the pop up image. 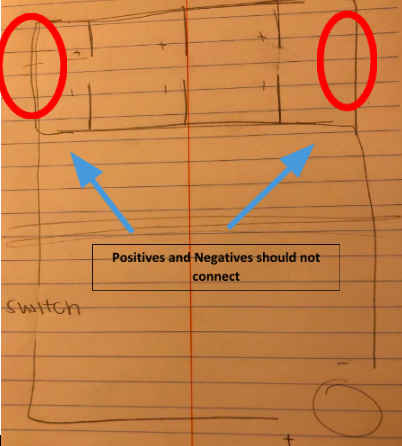 This is an area where I could have improved by creating a sketch of the circuit first and having it checked by a TA first. The most challenging part of this assignment was getting get use the copper tape and making the 90-degree angles. If I were to redo this I would try to incorporate more pop-up visuals. Overall this was a fun lab where I got the opportunity to be creative and be a maker which is something I don’t get to do much in my other classes. For the first sticker-making activity we made a Griffin sticker which involved us combining two animals together. I put together a turtle and a butterfly, I’ll call it a “turtlefly”. My original design on the computer had antennas connected to the turtle’s head but since they were so thin and small they fell off when I printed the sticker. The second sticker-making activity was to take a logo and make it into a new image. 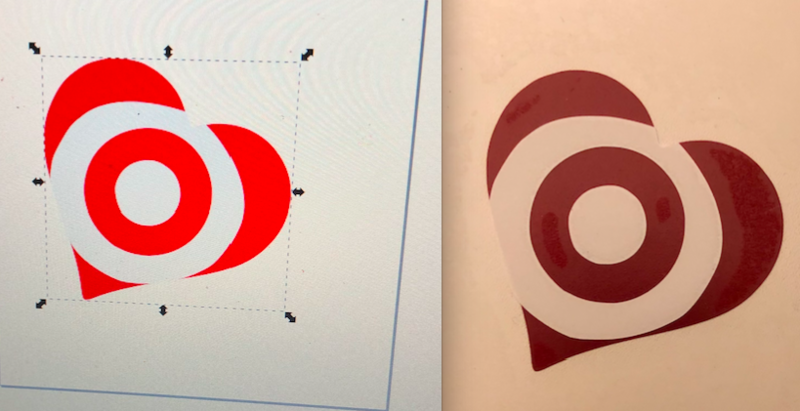 I chose to take the Target logo and format it into a heart, I did this by taking a target silhouette and putting it inside a heart silhouette. 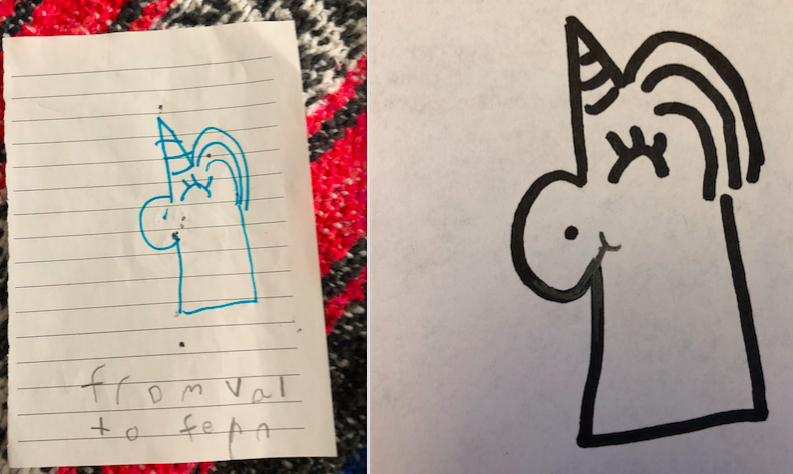 Finally, for my multi-layer sticker I decided to turn a drawing my seven year old sister made for me into a sticker to gift her for her birthday in a couple months. Since it was was drawn on lined paper I traced the image to get it on a blank sheet and scanned the image onto my computer and opened it in InkScape. 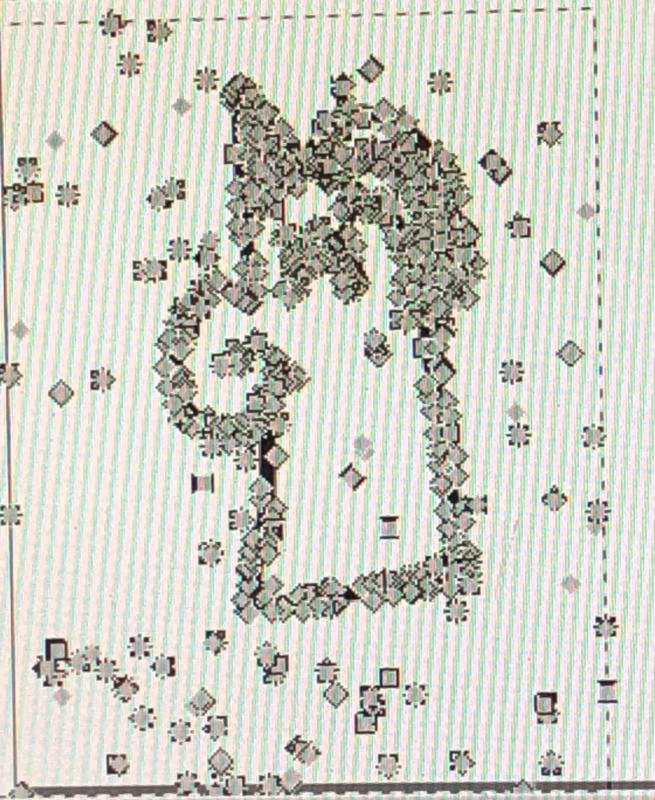 When I converted the image to a path in Inkscape there we a lot of nodes and I had to go through and condense how many there were and turn the drawing into complete shapes. This was a bit challenging for me as I wasn’t sure how to transform the sketch into seperate objects and still keep it authentic. After deleting, adding, separating and joining nodes I was able to make three distinct shapes: the head, the hair and the horn. The image above was my first attempt at printing. As you can see… it was a bit of a fail! 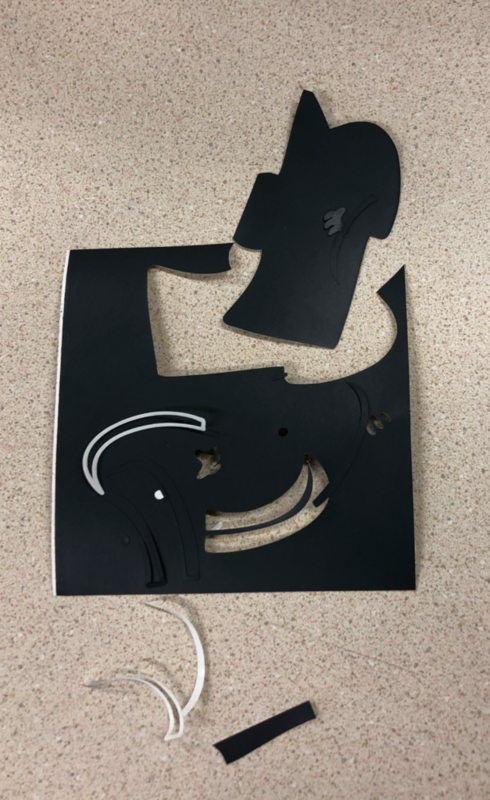 The vinyl wasn’t placed correctly and the unicorn’s nose got cut off and also I was trying to print the eye, nose, and hair pieces separately to layer it on top of the white. After some thought I realized I instead should cut these pieces out of the white piece. At this point I was ready to print. 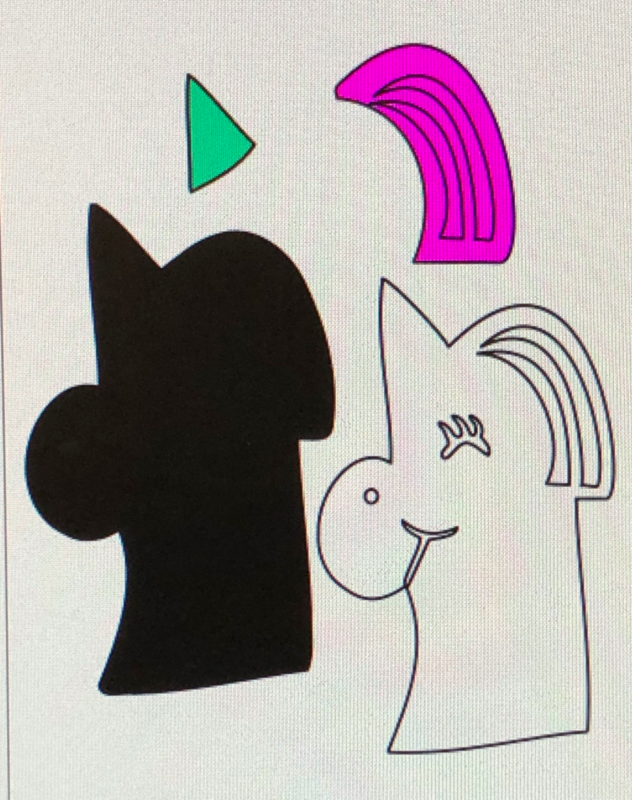 I have four layers: the bottom black outline, the white unicorn, the pink hair and finally the hat. 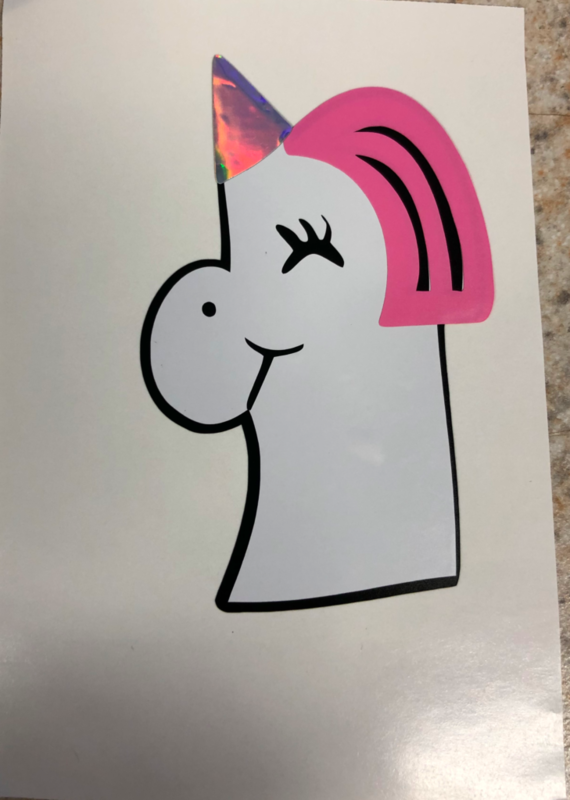 This is the end product of my multi-layer unicorn sticker. This week I gained some intuition on cutting and layering pieces to complete an image. 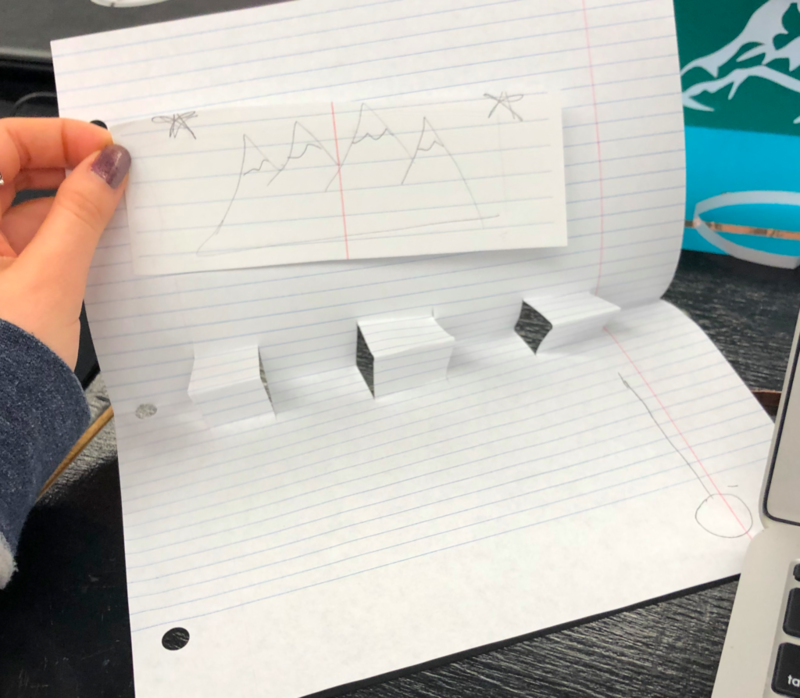 Last week we learned how Storyboards can help us communicate our ideas by depicting settings, sequence and satisfaction. During the class activity the people I worked with and myself decided to make an invention for the restaurant table-screen. I instantly thought about the devices Chili’s has at their tables that allows you to play games, view certain food items and even pay the bill. I thought it would be cool if we made an interactive touch-screen table that incorporated these functionalities of viewing the menu and playing games onto the actual table. 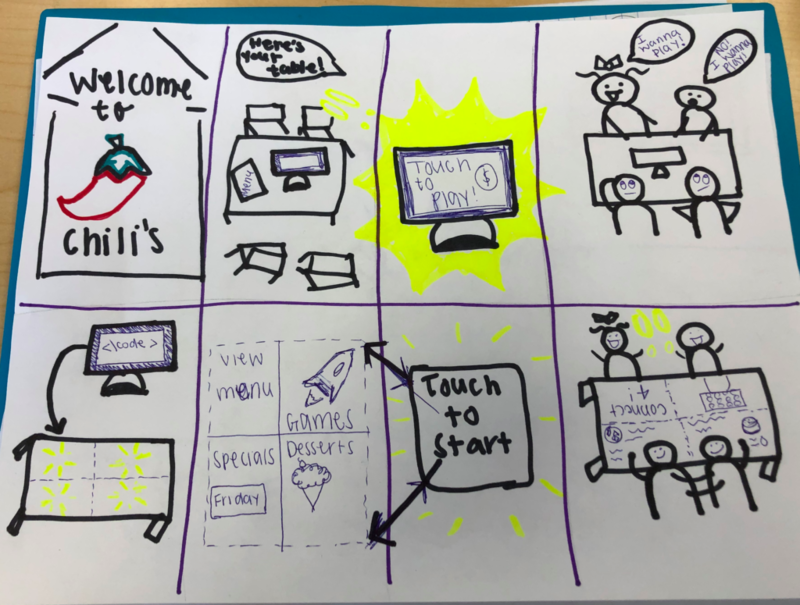 A group member shared how his little sisters are always fighting over who gets to play with the device, well with this interactive table each person would have their our own “screen” eliminating the sharing problem. The image above is from the class activity and as you can see I struggled a bit to get my ideas on paper. I realized I spent to much time on little details so I decided I would focus on simplifying my drawings for my final version. The image above is the new simplified storyboard I came up with and I have to say it gets the idea across much more clear than my first attempt. One thing I would have changed in my second version is I would have switched the 2nd & 3rd boxes in the second row so that it was seen as “Touch to start” and then displayed the options which are view menu, play games, specials, desserts. If I were to draw this again I would try to make the options look more like icons. 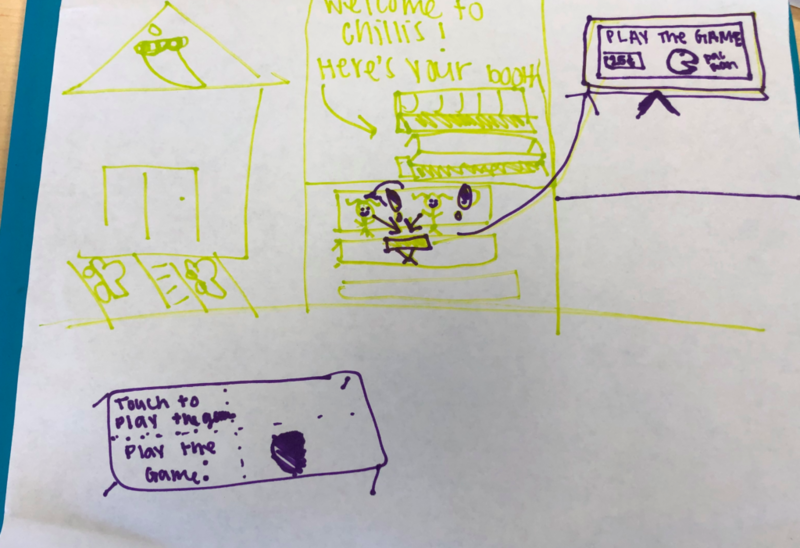 Overall this activity made me realize that drawing is a good thing and now I want to pitch my idea to Chili’s. When thinking about creating my name tag I got the idea to make one for my future work desk. I will be entering the corporate work force after I graduate this May so I wanted to create a name tag I could display on my desk! 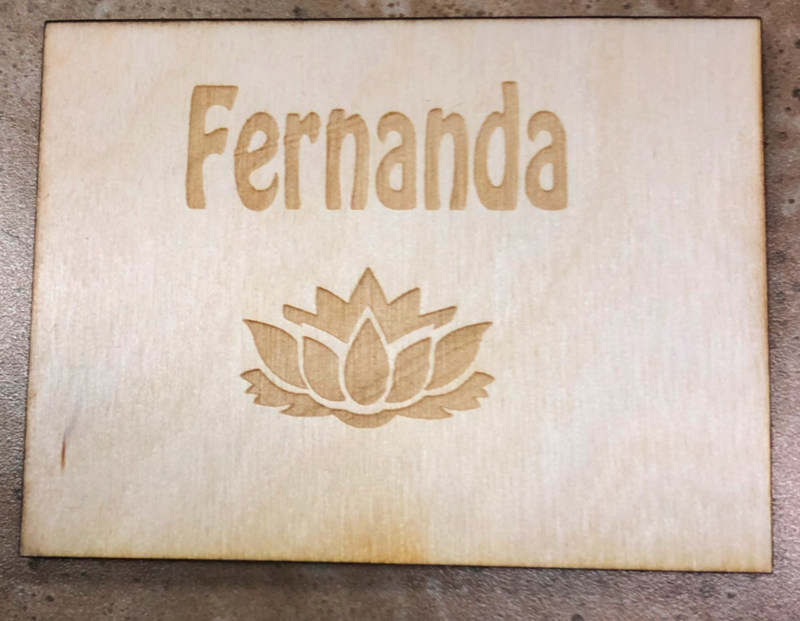 This was my first name tag I created with the laser cutting machine. The flower below my name is a lotus flower which made its way to my final version. While this was a quick draft my final version required a lot more technical work and creation. After attending the Friday lecture where we went over storyboarding I got the idea that I should sketch my name tag before creating it. 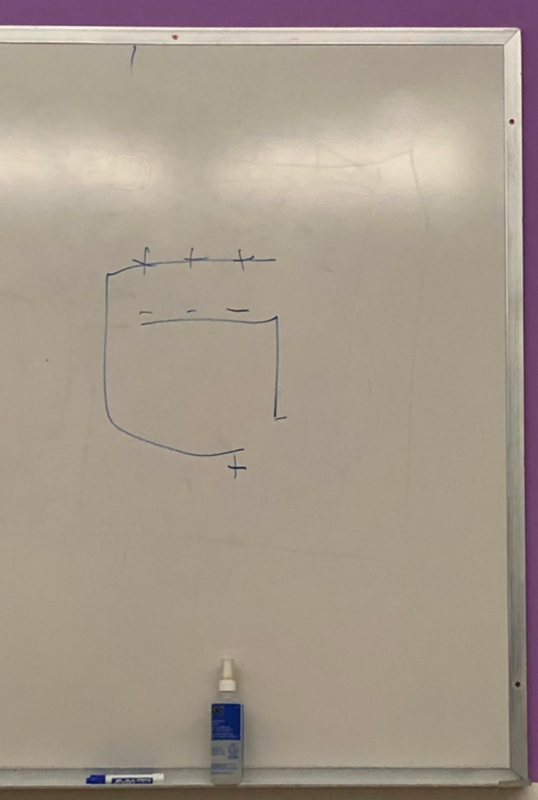 As you can tell I am not the best drawer but the sketch definitely helped me communicate my idea. On the top part of the paper I was brainstorming ways I could get the name tag to stand up on its own. I consulted Emilie, another INFO 490 TA, and decided that I was going to cut out two little triangles to support the rectangle part of the name tag. 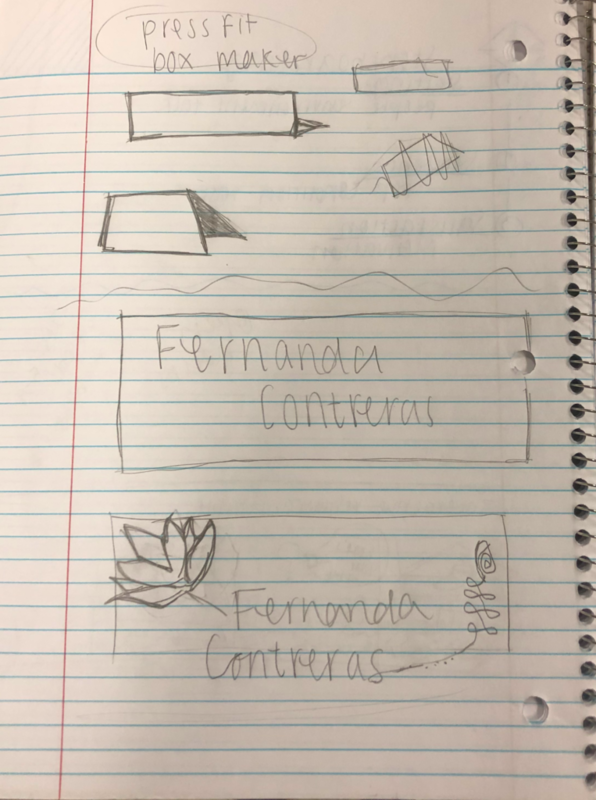 Once I sketched out my vision of what I wanted my desk name tag to look like I went to google images and looked for silhouettes of lotus flowers and unalomes which is what the squiggly pattern is called. Once I got my ideas on paper I went to InkScape, the vector graphic editor we are used in lab and got to working. The hardest part of working with InkScape was combining and smoothing the nodes of my images. I essentially made the lotus flower unalome drawing flow into my name so that is spelled it out. I also dragged out the ‘s’ of my last name so that it went into the other unalome. In order for everything to flow nicely into each other it was important that I combined and smoothed nodes. So I definitely feel more comfortable working with the node tool now. In addition, I wanted to explore with both the vector and rastering functionality of the laser cutter using black acrylic as my material. So you will see that my name is cut out – vector and the designs in the corners are engraved – rastored. The last step to my name tag was glueing the triangles to make my name tag stand up. I had to do this twice because the first (image above) I glued the triangles in a way that the name tag was standing straight up instead of tilting back. This is a practice post for our first lab section!